Yesterday when I was cleaning, I took notice to the small, upcycled vases sitting empty on my coffee table. 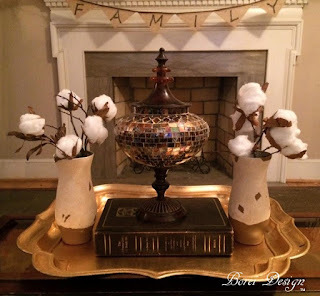 I made them last year (see DIY Pottery Barn Inspired Urns Using Dollar Store Glass and Cast Off Ceramic Containers) and decided it was time to add something to them. 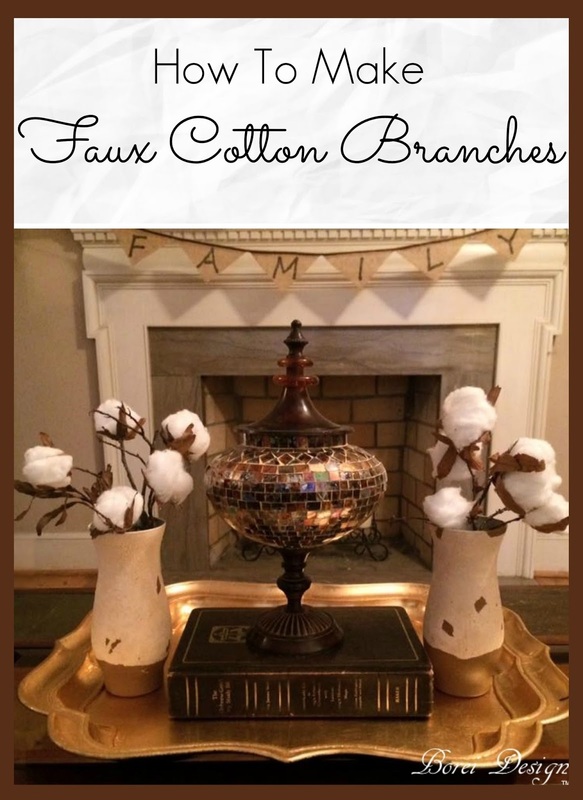 I decided to fill them with fake cotton branch stems. 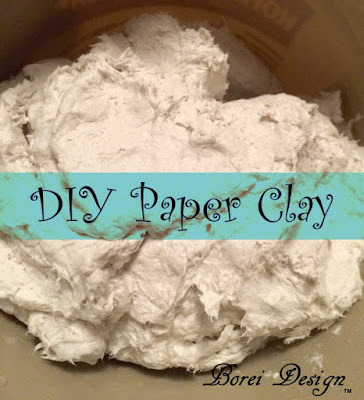 They were super easy, inexpensive and quick to make. Here is how I did it. I grabbed some leaves, twigs, a bag of inexpensive cotton balls and my hot glue gun. You can also reuse cotton from commercial medication packaging. My husband calls the leaves I grabbed, "penny oak" leaves. I'm not positive of the actual name but I know they are everywhere in my backyard. They worked PERFECTLY. If you cannot find them, I'm sure you can cut some other brown leaves down to size as a replacement. 1. 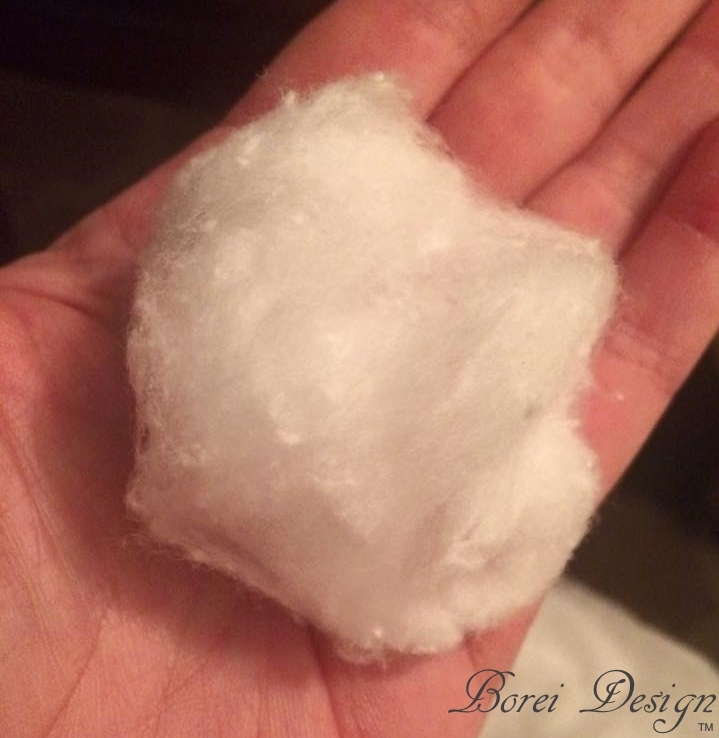 Fluff out some regular, store-bought cotton balls by pulling them out on each side with your fingers. 2. I hot glued leaves to the back. 3. I cut a small hole in the center of the leaves. 4. 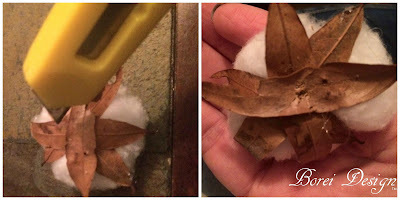 I added a little hot glue to an end on the stem, stuck it through the hole inside the leaves and up inside the cotton ball. I simply repeated the process until I was satisfied with how many cotton "blooms" were on the branches and I was done. My little coffee table vases are empty no more! Oh wow! thats a great idea, would have never though of that. I LOVE this idea! They look great. What a fun and unique craft idea! I love going to the dollar store it's like a head start and then we can get so creative SO much fun! This is one fun project indeed. Ahh, there they are after I saw theit introduction on Instagram. AS I drove by a field yesterday your post came to mind. Great job. Wow this is so pretty and creative! Thanks for a great idea! This is a great craft idea for Fall. I really like it! This is a really nice rustic look! I can see this looking great with Christmas decor as well. This is such a creative and fun idea! And it looks easy enough for me. Such a cute accent! Very rustic - love it! This is so creative as well as beautiful. Thanks for sharing. What an adorable and clever idea! 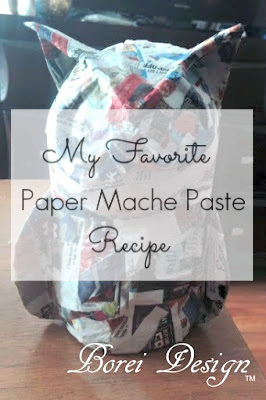 Loved the simple diy that you have created. Simple idea that looks very cool! Oh my goodness!! I love this idea, it's so creative. And something I think i could acutally do. 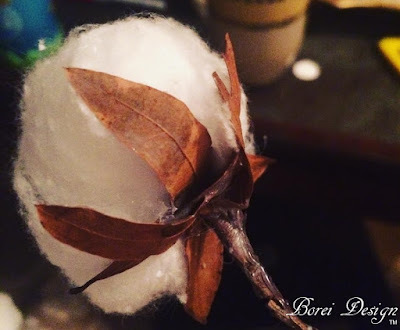 We live where cotton is grown (Texas Coastal Region)and we find raw cotton all along the Farm-To-Market roads. I even have some left somewhere and when I find it I know what to do with it now.